Tulip Tree (Liriodendron tulipifera): growing, planting, caring. 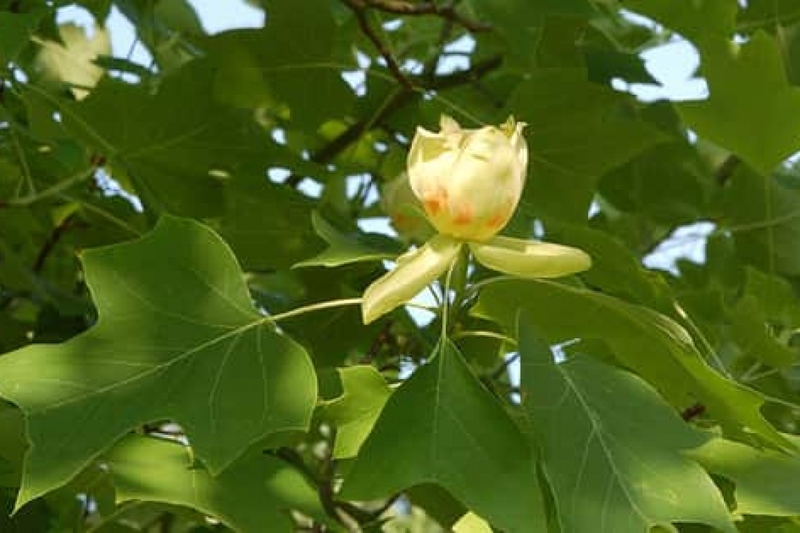 Liriodendron tulipifera - known as the tulip tree, American tulip tree, tuliptree, tulip poplar, whitewood, fiddle-tree, and yellow poplar—is the Western Hemisphere representative of the two-species genus Liriodendron. The tulip tree is one of the largest of the native trees of the eastern United States, known to reach the height of 60 m (190 ft), but its ordinary height is 20 to 30 m (70 to 100 ft). It prefers deep, rich, and rather moist soil - it is common, though not abundant, nor is it solitary. It grows fairly rapidly in its typical form with its head conical. Plant your tulip tree in deep, cool, drained, neutral to acid soil, in full sun or partial shade. Plan a lot of space around - 6 meters on each side is not a luxury. Plant preferably in winter, in bare roots or in mound. Dig a hole deep enough, twice as large as the root ball, without mixing the layers of the soil. Plant a solid stake at the bottom of the hole, on the edge, inclined to the prevailing winds. Cut the root hair - the fine roots that looks like hair - to balance the volume of roots and foliage. Plant without burying the boundary between trunk and roots of the tree, putting the soil layers in the same order you removed them. Tamp the soil around the roots with your foot, so you do not leave a pocket of air, and attach the stake to the trunk with a suitable extensible link. Form a hollow in the soil and water abundantly until you fill it.